I have been looking at the latest Greek bailout deal between the Greek government and the European Commission/IMF), which was concluded last week (June 16, 2017) and released a further 8.5 billion euros in new loans to the Greek government which means it can make bond payments due in July. Despite all the statements from the European Commission and the IMF to the contrary, the terms of the deal with the Greek government confirms that these institutions have abandoned any pretence to being interested in serious economic policy. For the European Commission, the desired irrevocable status of the euro, as a political statement, is all it seems interested in when it comes to Greece. They just don’t want to admit that Greece cannot reasonably function in this monetary union. Just like the previous bailout agreements, this deal will fail. It actually only stalls the reality for yet another day and the only goal it serves is to keep Greece using a currency it cannot afford to use – afford in both monetary and real terms. The bailout payments are part of the so-called “third economic adjustment programme for Greece” which “started on 19 August 2015 and is scheduled to run until 20 August 2018” (see Greece: the third economic adjustment programme). The overall payments forthcoming in this third plan were 86 billion euros. The overall aim of the programme is to secure a return to sustainable economic growth in Greece. The Eurogroup have been holding steadfast to their claim that to declare a debt jubilee for Greece would be tantamount to ratifying what it considers to be profligate public spending by the Greek government. Of course, there is no way that Greece can repay its outstanding debt in euros. The creditors including the IMF, the ECB and the EMS (the private banks have been dealt out of the picture in previous bailouts) will take a loss one way or another. The infighting among the creditors has been a feature leading up to this latest agreement (fragile as it is). The Eurogroup’s motivation has nothing to do with helping Greece out of the Depression it has been in for the last 9 years, a Depression created and maintained by the Eurogroup itself. Its motivation is to shore up Greece just as long as it remains in the Eurozone, so that an exit doesn’t occur. Why are they so scared of an exit? Quite simply because Greece would quickly get out of its malaise if it restored its currency sovereignty and started creating jobs and generating domestic income growth. This would demonstrate to all and sundry the benefits of currency sovereignty and the costs of austerity, especially when the austerity is imposed in a foreign currency (the euro). I imagine Italy would have a hard time explaining why it was remaining in the Eurozone under increasingly difficult economic conditions and declining living standards, when Greece started booming once it exited. The Eurogroup thus need to keep Greece on a string – under its control. Note that the IMF are also playing games. The IMF boss claimed that she would only propose an Approval in Principle to the IMF executive board, which is a maneouvre that, under IMF rules introduced in the 1980s, allows it to extend funds even if the exact commitments haven’t been reached. The sticking point relates to the terms of any debt relief for Greece from its “European creditors”. Significantly, the IMF admit that the “AIP procedure” operates “without guidelines”, given that the original “guidelines are no longer applicable” because “they were designed to address the specific context of the 1980’s debt crisis”. In other words, anything much goes – business as usual for the IMF. But at least the IMF realise that the absolute debt that Greece is liable for will never be repaid. What they haven’t understood, however, is that this crisis will continue – current debt levels or not – while the harsh austerity programs are being enforced. The Greek problem is not its debt levels. Its repayments are actually very low given the interest rates operating. The Greek problem is a spending problem. Non-government spending is weak and government spending needs to be much higher. Far from running primary surpluses, which will never support growth, the Greek government needs to run significant deficits for an extended period. It has to exit to do that. And that is why I have always supported exit. If you examine the terms of the latest agreement (outlined in the Eurogroup statement on Greece) some things will strike you immediately. … a primary surplus of 3.5% of GDP until 2022 and thereafter a fiscal trajectory that is consistent with its commitments under the European fiscal framework, which would be achieved according to the analysis of the European Commission with a primary surplus of equal to or above but close to 2% of GDP in the period from 2023 to 2060. Can you believe any government that claims it wants to put the welfare of its people first signing up to that. Running primary surpluses over the medium term makes it possible to reduce public debt and restore fiscal sustainability, which is essential for returning the economy to sustainable growth. The first part of the statement is true – a primary surplus (if sustained) allows public debt to be retired on maturity. But the second claim about being “essential for returning the economy to sustainable growth” is not correct. Greece runs a current account deficit (driven by the trade account with a primary income surplus). So the external sector is draining growth. To think that any nation could support a primary surplus which undermines growth for 43 more years in this context is nonsensical. Historical data will show that no nation has been able to achieve that. The on-going fiscal drag implied by such a net spending withdrawal will prevent the economy from achieving any significant growth, and the external sector will not come along to rescue the situation. It means that with stagnant growth depressing income growth for workers and fixed income recipients will be exacerbated by the fiscal drag. It is a scenario designed to fail. 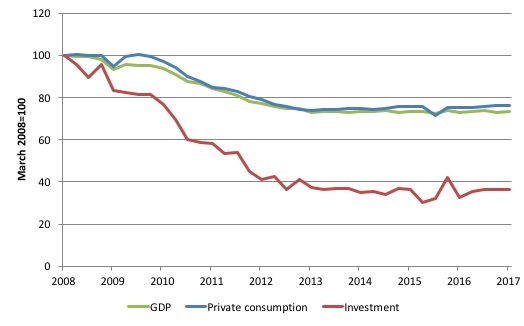 The first graph shows the evolution of real GDP, private consumption and gross fixed capital formation (investment) from the peak in the March-quarter 2008 to the March-quarter 2017 – 9 years of travail for the Greek nation. Real GDP has slumped by 27 per cent, Private consumption by 24 per cent and investment by a staggering 74 per cent. The other notable feature is that the Troika engineered the Depression in 2009 and 2010 through to 2012, then have put Greece in a holding pattern – despite all the talk of growth-friendly austerity. There has been very little gain since 2013. In fact, the real GDP index was at 72.9 points at its worst in the December-quarter 2013 and is only at 73.2 points in the March-quarter 2017. The other thing to note is that despite all the on-going ‘internal devaluation’ cutting wages, pensions and labour costs in general, allegedly to increase the international competitiveness of the nation, the export index which in the March-quarter equalled 100 (by construction) is sitting at 97 points in the March-quarter 2017. Does internal devaluation boost external competitiveness? The BIS ‘real effective exchange rate indices’ (REER), which are internationally accepted measures of international competitiveness that adjust nominal exchange rates with other data on domestic inflation and production costs can help us determine the answer. If the real effective exchange rate rises (falls) for a nation, then it signals a loss (gain) in its international competitiveness. The following graph shows movements in real effective exchange rates for two distinct periods. The first, the period of growth from January 1996 to December 2007, then the period from January 2008 May 2017 (the latest data). The graph allows a comparison of selected Eurozone nations. Given Germany’s trade dominance both within and beyond the Eurozone, we would be looking for Greece’s REER to have fallen more than Germany’s to change the former nation’s relative international position within the Eurozone. The data shows that following the introduction of the euro, international competitiveness for all the nations shown declined except in the cases of France, Germany and Finland. Further Germany made relative gains on the rest. Following the crisis, the general tendency has been for real effective exchange rates to decline. However, the real effective exchange rate for Greece was only 9.3 per cent lower in May 2017 than in January 2008 despite the massive austerity program it has endured. By comparison, the real effective exchange rate for Germany fell by 11 per cent over the same period. Of these Eurozone nations, only Ireland improved its position relative to Germany over this period. So we conclude that the massive internal devaluations that Greece, Italy, Portugal, Spain and Finland endured in this period did not restore competitiveness relative to Germany. Conclusion: what was it all for? No answer required. It was part of the destruction of resistance in Greece in preparation for ‘colonisation’. The following graph, which shows the employment-to-working age population ratio (over 15 years). In the September-quarter 2008 (the peak employment quarter before the crisis), the ratio was 49.2 per cent. In the March-quarter 2017, the ratio is 39.8 per cent. Had the ratio remained at 49.2 per cent, total employment would be 860 thousand larger than it currently is. That is one measure of the scale of damage that has been inflicted on the labour market. From another perspective, the next graph shows the actual unemployment rate since the March-quarter 2001 to the March-quarter 2017 (blue line). 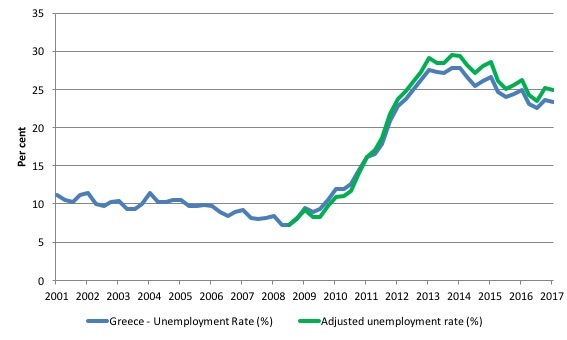 The green line is the simulated unemployment based on the peak participation rate before the crisis (September-quarter 2008). The participation rate has not dropped that much – 1.1 points – but the adjusted unemployment rate in the March-quarter 2017 would be 24.9 per cent compared to an already high 23.3 per cent. While the European Commission talks about progress under the bailout plans, the reality is that the unemployment rate has been stuck at its current level or thereabouts for 2 years now, after it dropped marginally from 2012. The available statistical indicators all point to the same conclusion – after engineering a Depression, the managers of Greece (the colonial masters) have put it into a holding pattern of stagnation. They cannot claim that prosperity is just around the corner with current policy structures in place. The other point to note by way of comparison with the various graphs is that it is impossible to run the structural rigidity line when trying to explain the evolution of the Greek economy. The correspondence between the collapse in output and employment – linked via the derived demand for the latter as a consequence of the former – and the correspondence between the demand-side of the labour market (employment) and the unemployment rate quells any suggestion that the collapse was driven by supply-side shifts in preferences by workers or rigidities emerging from employment protection, minimum wages or any of the other suspects that are wheeled out by the likes of the IMF, OECD and the European Commission when trying to deflect blame. This is a massive demand-side induced Depression that Greece has been dealing with – deliberately inflicted and persisted with by the Troika. It is clear that the European Commission’s dealings with Greece have nothing to do with economic reasoning, despite the articulation of those dealings being expressed in terms of economic aggregates. Obviously, the Commission wants to prevent that reality so as to keep other Member States (such as Italy) in line. 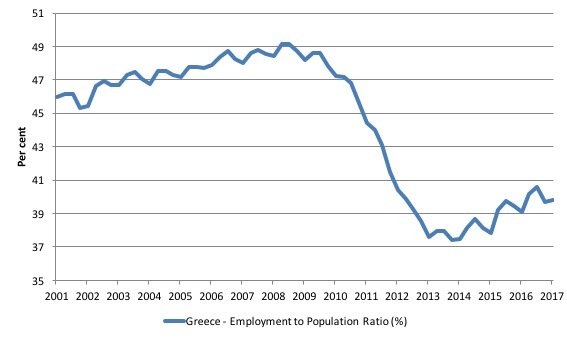 Even before the crisis, the employment rate for the working-age population was only 49.2%. That is not very high. It indicates Greece’s growth potential. If they could reach an employment rate of 60%, then that would mean a huge increase in output. You defined working-age population as the population over 15. Isn’t it 15 -64? Bill, does participation rate take into account the mass emigration of Greek citizens? Curious how that is factored in if Greeks haven’t advised the government they’ve left particularly to the EU zone without any border controls. Also What about cash in hand work which is apparently also hugely prevalent in Greece due to the ridiculously high taxes being imposed that simply makes working within the system not worth it. They interviewed Greeks for an NPR podcast where many said this was the case. People simply don’t have the money to spend so they have to avoid taxes which I don’t really have a problem with when you hear how crazy the taxes on businesses are. They have to prepay taxes a year ahead and other crazy costs. I also admire your positive attitude regarding Greece booming post grexit but the media will spin it as a huge disaster that when repeated enough becomes truth. Keep telling lies over and over again and it becomes the accepted reality. Worse case the voters believe it and then the government does stupid austerity in response and reality is likely to be much harder than it should be. Thanks for the great blog as always. Varoufakis has said a number of times that leaving the euro was like Hotel California: “You can check out but you can never leave”. (He has said the same thing about the EU and Brexit). His argument was that it would take some time to organise a new currency and that during this period Greeks would move their Euros out of Greek banks in anticipation of a default and a depreciation of the new drachma. The economic “miracle” man Schaeuble have made a speech at the American Academy in Berlin. As reported at Blomberg – Germany Warns U.S. Against Ceding Lead Role to China, Russia. In Schaeuble and Merkels Bavarian housewife model everybody should have Current Account surplus, “sound” economics. So, you could have budget balance/surplus. But who should supply the necessary deficit in the Schaeuble world? This from the country that for decades have been “living” on US, UK and fellow EU-members deficits. So, she is!? In her view the Hartz “reforms” was in the interest of open markets? The European economic “miracle” where they have put large swats of the working age population on so called mini jobs and poverty is growing year by year and vital infrastructure is decaying due to the Bavarian housewife model. All to hinder the Germans to buy imported gods/services so they could show of Current Account record after record. And lecturing the world about “sound” economics. And now Schaeuble is afraid for the fall of liberal world order if US/Trump go for “trade war”. I.e. the world order where Schaeuble and Germany been able to act as scavenger on others deficits and in cases like Greece and others to the point of their collapse and misery. What is truly remarkable is the American left that see EU/EZ as some progressive entry and lament Brexit as something very bad. I noticed that too. Perhaps there are social reasons why the employment-to-population rate is so low, for example women are less likely to seek paid work than in countries such as the US and Australia. A primary surplus is when “current revenue is higher than its current spending (except for interest on the debt)”. Is it fair to say that this could still be an expansionary fiscal stance under certain circumstances? Such as when the interest on the debt is going to the citizens of that economy? I imagine that a lot of the interest in the case of Greek debt is going to foreign creditors who probably are less likely to spend it back into the Greek economy though. The sectoral balances will show that a country with a current account deficit must run a government deficit of at least the same scale or the private domestic will end up dissaving. 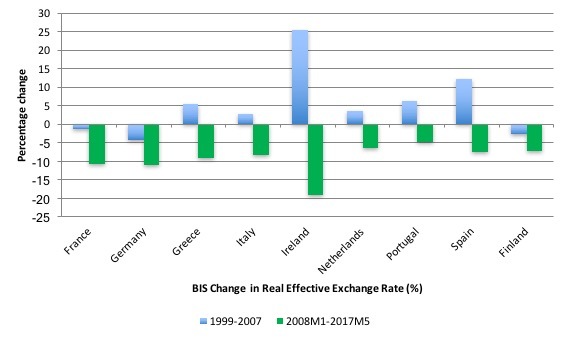 The ‘Real Effective Exchange Rate’ indices seems to prove that the troika’s plan for Greece was never going to work and that it probably was never really intended to work. The austerity and the resulting unemployment and depression were supposed to force a decline in production costs in Greece in order to allow them to run a current account surplus which would theoretically allow for a balanced budget (and the all important debt repayment) along with growth. The REER indices show this decline occurred and it is more than apparent that the depression and high unemployment occurred. But the current account surplus hasn’t appeared. This is because Greece was unable to lower its Real Effective Exchange Rate relative to its trading partners, many of whom were also lowering theirs? I have no doubt the Germans are saying that this (the lack of a relative decline in REER) just proves Greece didn’t try hard enough. If I am understanding the above correctly, your article is a very good criticism of the Eurozone policies towards Greece in particular, and their overall problem in general with the Euro. (I am sure it is an excellent article even if I am not understanding). If Varoufakis knew MMT, he would not use such silly arguments. ‘just proves Greece didn’t try hard enough.’ The ‘didn’t try hard enough’ meme is a favourite of the neo-liberal rigged game. here in the UK, since Thatcher the population has been pummelled by that meme. So if you are on a debt treadmill, you’re just not spinning it fast enough -keep going! im curious about the level of banking infrastructure that would need to be in place for them to make a move, since its been all outsourced . The main issue is that the Hellenic central bank is run on equipment that is owned and operated by other European Central Banks. The ‘Single Shared Platform’. This is run by France, Germany and Italy. TARGET2 is a physical mechanism of control over EU governments that allows the ECB to turn off the central banking systems of any member country. Which is what they threatened to do with Greece during the debt crisis. The one thing the monetarists realised is that when you have control of the central bank, everything else is irrelevant. Those who hold the purse strings run the show. Any determined government with the support or acquiescence of the people can take on international organisations like the EU bureaucracy or ECB. Power ultimately comes out of the barrel of a gun and not the bankers boardroom. It is essential for the Greek people for Greece to leave the eurozone and not to comply with any imposed austerity, asset sell off or fiscal surplus demands. So far all of Greece’s governments have shown themselves to be corrupt or spineless and to be traitors to the Greek people. so what your saying neil , is that the greeks would have to build their own parallel central banking infrastructure before they could get out . their own manhattan project of sorts. and they would have to temporarily nationalise the greek banking system ? so how would you get around target 2 for starters? go Maxwell smart and build a second central bank behind a flower shop ?